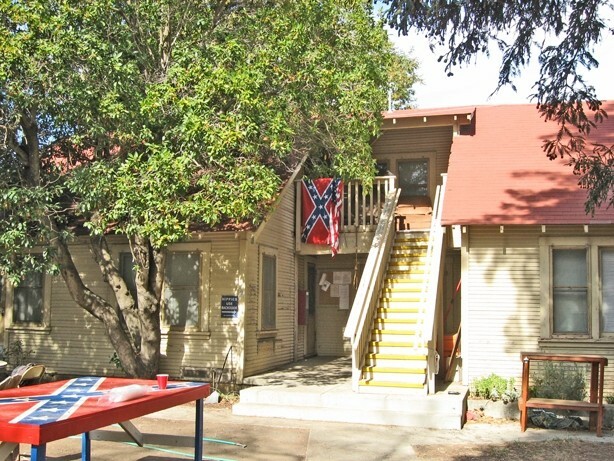 Cal Poly University officials say they’ve spoken to residents after racist symbols and words were found adorning the Crops House, a university-owned house where agriculture students are given subsidized lodging in exchange for work on the school’s farms. Responding to inquiries from New Times, school officials said they’d confirmed that a racist sign was posted at the house during a recent party. It read: “No n***ers,” along with a similar slur against gays. 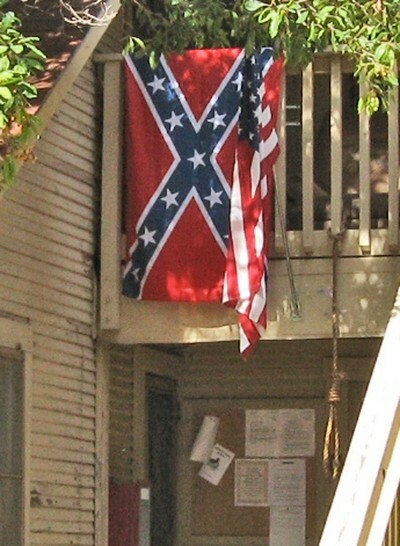 CONFEDERACY ON DISPLAY : A confederate flag can be seen adorning the Crops House, with the same symbol painted across a table out front. In a more recent visit, reporters saw a Confederate flag tacked above the entrance to the house, draped near a hangman’s noose. Another large Confederate flag was painted on a table in front of the house. “I have found out that, in fact, it is true,” John Peterson, head of the Department of Horticulture and Crop Science, said of the racist sign seen at the party. Petersen initially responded to questions about the sign and symbols with disbelief, saying that the noose could have been part of a Halloween decoration. Still, Peterson said he followed up by visiting the house, where he saw the Confederate flag, but no noose and no sign. He said, however, that the issue was nonetheless being taken seriously. The word aside, the flag and noose are considered undeniably racist symbols, according to The Anti-Defamation League, particularly when placed next to each other. Still, Peterson said, there is a First Amendment question involved. A CLOSER LOOK : A hangman’s noose can also be seen tied on a railing near the Confederate flag. Between them flies an American flag. Beyond that, he said, there is no way to know who posted the sign. Although Peterson said he spoke to students at the house, he said no formal punishment was forthcoming. In a written statement, house residents called the displays “inappropriate” and said they were “truly embarrassed” for how their actions reflected on the university. The Crops House is an extension of the dorm system, according to Petersen. It is one of six houses for students in the various ag majors, including houses for dairy-science students, horticulture students, and animal-science students. The houses are run by their respective departments. About six students live at the Crops House during the school year, without anyone filling the position of resident advisor. In dorms, R.A.s are students who receive room and board in exchange for helping enforce university housing policies. The house sits at the end of an unmarked dirt road that leads off Highland Drive through fields and orchards. Next to the house, a garage houses a pool table, and an assortment of vehicles are parked in a lot nearby. Peterson said that the Crops House, and others like it, exists to enforce the learn-by-doing method preached at Cal Poly. The students perform roles that would be taken on if Cal Poly’s farm were a family farm, rather than a project. They are responsible for such tasks as turning on heaters in the orange orchard in the event of a sudden freeze, or taking care of problems that might arise after the nine-to-five farmers and faculty have gone home.